Welcome to your TOPterm information page! You are interested to go abroad and gain unique skills in e-commerce and logistics? 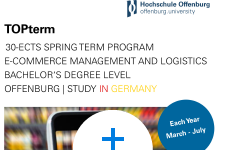 Then join our TOPterm program in the Black Forest next spring! Excellent labs, company visits, interdiciplinary team projects, and specific e-commerce and logistics workshops offer you a great variety of learning environments!